a decline of $2.5 billion or 38 percent. the September volume of $10.0 billion. creases in the machinery categories. at $156.9 billion, up $4.2 billion or 2.7 percent from September. category increased $0.2 billion or 3.9 percent to $5.2 billion. has increased 3 of the last 4 months. was down $0.2 billion or 1.1 percent to $21.9 billion. equipment backlog of $1.3 billion or 1.2 percent. has been declining since June when the ratio was 1.72. $0.5 billion or 5.5 percent. report is scheduled for release on December 31, 1980.
fiscal year on the seasonal pattern of the industry. during July, August, and September, for the forthcoming model year. subject to any special estimating procedure. Ruth Runyan or Kathleen Swindell, (301) 763-2502. U.S. bank. Price, 30 cents per copy, $3.60 per year. *-a .a N.c -s a. .
*................- 4 3- .3.1...~ 3.1. .1.-. 1.3. .3... = 3.3.3.31.33. 3.1.3.1.. 33 -a- N ~3 .3~ 3..0.~ 0' 1.3.. .33. N 3.33' 3~.. 3 33.3.33,3.3. (.3.3.. 3 .1... 1. -.1. 3,. * 1. .-31. N3. N. 5.3.> 33 3 .3. 33... 333 3.33. .04 .3~U 3. - 3. 3 3.3.. 1. 3.3.3.a.... 33 33. -N31.a .3 .1. 331.3. 00. 3.3. '3.3O33.3~ 3~333 a N3. -3.0=0.3.3.. 1.1.3.1. 3. N3.3. ~3.3. -3 ~- ~3.03 3. 34 33.33.3303N303...3...1. -- 3. 1.5 33.3.N3..-43. 3.1. .3.0 a' 1.3.
a ^ _____ 5'. 04 4 0 ".04 0" 4" 0444"" 04- 443 4. *-i0 ~0 044^"'^ *'..-.-t 01J .4^ G' .0 0 0-04, 00 04. 44 . ( 0 4. 4," ., *"
o,'4 > ii-y < 3 A a n sr 0 '' ~r s o y >m ^ ;"
O^ 4 f* 4( 0 4 4 0 4 4 0..11*--? B t B i--.4 4- 4 4-% -3 B -- 0. > a- t ^^- sG3*i )ltl *^ eeuco ^ -o.--' oo .- -. 0 0 o04 *--a. 0.
s/ s **^ oitT' 'tCO' -s''^ *o.0 0: : a. ..5. a"
0" ^ gM a:;u$XS< :w f~a 8:......= c g.0&1< 4.- -8;a a. C -i 0' 0- 4y 0' 0' 0'N 0Sut *' 0'^ 0' 4i0' a0' t i0C 0'T OC-. 4-0^ "
1- 00 00' 01 3 .0. 0 00 ... .. .. ..... 00..
0003 01- 001.01 0 1 0. 0 0 ca ... 00..
O0. 0410 0 4' . ot 44 4 4 4 4r -oSwO*^ ^Sa -"
.4 4u 44 44 "
C& i Cir C' C' 0 'C C C CC t f C~r C-C C.CC C'-t^T rit-. to 0 a. a -405.
to o 0 rt d E-. 4r 4ae tt~to V4 B . =1 -. 444. 04T 05.4U U 0. 0... .. o C CM 0? o~~~M o .1 9 ... .. ..
._, CO. ... S o w .
*''4: 'C .3 6 A C- "R : ." hA' C tx44 C CC 44 Cs 'C CC C 4 'CA 'n 04441i s c a c .
c ~ ~ o ra4 C a -4i C.- "
O CASrf 'A 0 C I w--. "<- *-* ^ EI u a..3 asE .tC ai 3 a M0- CS CCC,-..
N t NCC CUE 505 f 3*tOI. C, CC C< CC ,C N CCNN 050C CC C .
C, C C SN "
C Ct N- 3C Nc5*"
C *N C CUC Eo. *u. ..++ .+ + . : -. a. v .
.,.0U'... 41 0... .000 0 "
4.0<*.04,41U0 .3 ***03. *J 4, .0 C0l 4 1C. * 3 ** 0 DOS* f <"
41004 41 410 0 41 0= 0. 4 :T i 3p '* 1 -0 4 0 41* 0044 C V* 0. 'Method of calculation of these percentages for 3 month and 12 month time intervals has been revised to reflect compounded monthly growth rates. (NA) Not available. PPreliminary. rRevised. (X) Not applicable. products; building paper; die-cut paper and board; chemicals; petroleum and coal products; and rubber and plastics products, n.e.c. cation (SIC) system and area data for industry groups. reporting is not followed by all large companies. 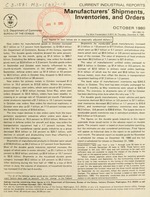 are published in the M3-1.8 report issued in August 1979.
to fewer limitations than the unfilled orders estimates. primary metals and motor vehicles and parts. different inventory categories in the aggregate statistics. contracts are included in these figures. orders received for products that are shipped from inventory. tions of previously existing contracts. new orders in these industries. S--- paper $9 (S/N 003-024-02130-7) VjA' Total charges $ Fill in the boxes below. I EI I I 4---l For Office Use Only.